Makerere University’s ResilientAfrica Network (RAN) Innovation Lab officially opened! // You Are Here: Home / Makerere University’s ResilientAfrica Network (RAN) Innovation Lab officially opened! 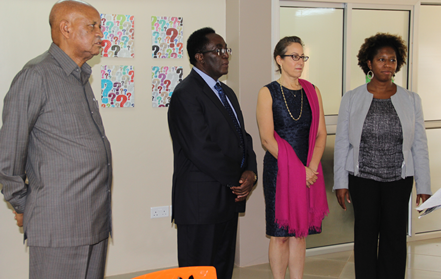 The Makerere University School of Public Health-ResilientAfrica Network (RAN) http://www.ranlab.org Innovation Lab was officially opened on 13th August 2014. This occasion brought together over 350 Agricultural Experts, business entrepreneurs, policy makers, disaster response experts, mathematicians, politicians, Public Health experts, engineers, community, Innovators, water experts, students and the faculty among others. The lab located on Plot 30 Upper Kololo Terrace in Kampala Uganda. Prof. Nelson Ssewankambo, the Principal Makerere University College of Health Sciences, which hosts the School of Public Health in his remarks shared that, he was proud to identify with the School of Public Health because Innovation was the way to go. He encouraged the listeners to do their best at all times “In all you do, do the best you can and always put forth your best foot”. The Vice Chancellor Makerere University, Prof. John Ddumba-Ssentamu in his comments noted that African community challenges needed African developed solutions. “ We are the best innovators for solutions to address African community challenges, because we live within and know these challenges very well. Let us not wait for other people to develop solutions to address our own challenges” He commended both the U.S. and Ugandan Government for the commitment to support Makerere University. He pledged to facilitate fair allocation of the available funds for the benefit of the communities in need. He also noted that it is projects like RAN who had enabled Makerere University to attain the position of one of the best institutions of higher learning in Africa”. The Chancellor Makerere University, Prof. George Mondo Kagonyera who was also at this event noted that, there was need for Universities to support projects like ResilientAfrica Network (RAN) even beyond the support being offered now, given the tremendous work being done to impact African communities. The Chancellor urged all faculties to learn from the multi-disciplinarity approach applied by the ResilientAfrica Network (RAN). This he said allowed for all participants to build on the existing efforts, knowledge and skills other than re-inventing the wheel. He also noted that the biggest problem in Africa was lack of knowledge and evidence. Prof. William Bazeyo, the Dean Makerere University School of Public Health/RAN Chief of Party joined all the other speakers in applauding the United States Agency for International Development (USAID) for the continued generous support and added that the ResilientAfrica Network was here to take the Universities from the Universities to the communities, thereby bridging the gap and addressing community pressing challenges which present as disasters, in form of shocks and stresses. He noted that, the Innovation Lab would only support Innovations developed to impact the communities with a multiplier effect. He reminded the participants not to underestimate the potential of the innovators who were present.